Last post <link> about my project to create a useful battery operated temperature sensor I whined a while about the flaky behavior of the TMP36 sensor. I'm not the only person that has had this problem. A simple search with Google will turn up person after person that has fought this problem. People have tried intricate filtering techniques, averaging, continuous averaging, everything they can think of to settle this device down. In the post I used the average of ten readings to get mine. Even with that, I had some trouble. This is on a battery supply, so there's no ripple or chatter from a buck supply, very low noise. I thought it could be the XBee transmission, so I added a little time delay to keep the XBee from transmitting at the same time as the reading. Nothing seemed to help Then, it occurred to me that I'd had a TMP36 setting outside hooked to an XBee using a pretty noisy wall wart for a supply continuously for a couple of years and never noticed a problem with it. What's up with that? Why did it work on a fence post and not in my house? I drug out the remains of the fence post temperature sensor from the box I'd tossed it into and thought about it a bit. I had put a voltage divider between the output of the TMP36 and ground to extend the range of the reading. Since I was using a tiny reference voltage, the max temperature I could read would be 120F and I needed more than that to have an outside sensor here in AZ (Don't try telling me to move, winters here are wonderful). Could the device need a load on the output? 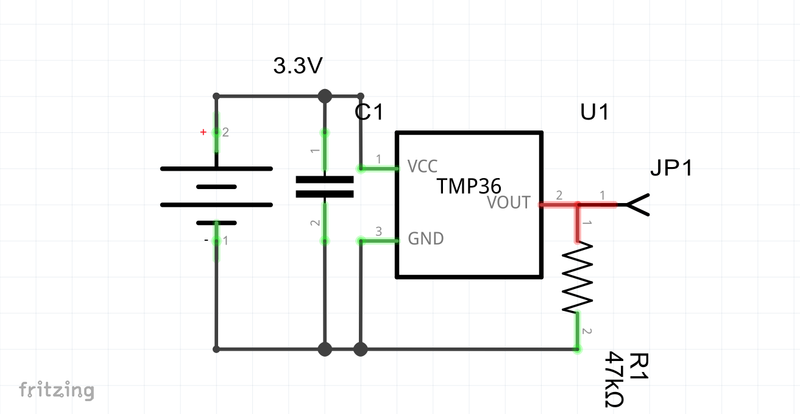 I looked up a datasheet on the TMP36 and looked at the schematic on the device; the device has an open emitter output. I had never noticed that before because I was looking at tutorials and such and they all showed the TMP36 feeding directly into the input of an Arduino or other MPU. I had to try it. I dragged out a bag of resistors and took a look at the maximums of the TMP36 and settled for a 47K resistor, and grabbed a .01ufd capacitor and added them to the circuitry of the board. Everything worked fine, but I still had the averaging in the code, so I removed that and put the board back in service. The .01ufd cap is as close to the chip as I can get it as is the resistor. I simply plugged them into the breadboard. Could it be that all the tutorials out there are wrong ? I went looking again and never found a place where someone pointed this out. There were long discussions on the time it takes the input cap on the A/D converter to charge, a myriad of algorithms on smoothing (some of them mine), etc. Then, I stumbled across another person that came up with this <link>, Dr. Monk found the exact same thing. I was a little embarassed until I noticed that he posted on the 16th of this month, after I started this particular project and well after my other attempts, so I was right in line with his discovery. Great minds think alike (slowly). I'm going to watch this over time, but it brings this little temperature sensor back as a very real possibility. I'm also going to try another sensor the DS18B20 since it comes in a cool waterproof housing as well as the TO-92. I even want to experiment with a bimetal sensor that is heat resistant for monitoring food. I can't believe I missed this for YEARS. Edit: I finally got this sensor under complete control with some additional work on the software detailed here <link>.